Members of the Erie-Niagara chapter. 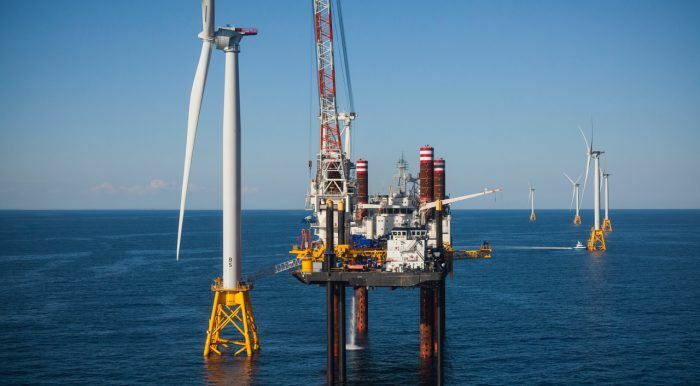 The Block Island Wind Farm (BIWF) is the first commercial offshore wind farm in the United States having been awarded and recognized for its global innovation and groundbreaking achievements as America’s first offshore wind farm. The BIWF consists of five, 6 MW wind turbines totaling 30 MW of offshore wind generation approximately 3 miles southeast of Block island, RI in the Atlantic Ocean. Power is delivered via a submarine cable connecting from the facility to Block Island to benefit the residents and connect to the electrical grid. Many first milestones were accomplished through the development and construction of this project paving the way for future growth of offshore wind in America. Our presenter, Corey Kelkenburg, PE, the Deepwater Senior Electrical Engineer, is a Western New York native as well as a graduate of SUNY at Buffalo with a degree in electrical engineering. Now residing in the Providence, RI area he is integral to the success of Block Island and Deepwater Wind. Corey started his renewable career with the New York Power Authority later stepping over to First Wind. Leveraging is experience, he helped build First Wind to over 1000 MW of wind and solar facilities before joining Deep Water as their lead technical resource. He continues to not only support Block Island but lead technical and development efforts in continued Deepwater activities. Deepwater Wind is a leading U.S. offshore wind and transmission developer. The Company is led by a veteran team with extensive experience in developing renewable-energy projects. Actively planning offshore wind projects to serve multiple East Coast markets located 15 or more miles offshore, including Massachusetts, Maryland, New York, New Jersey and Rhode Island. Visit www.dwwind.com for more info. We hope you can join us as Corey discusses the development and construction challenges faced by the Block Island Wind Farm. Soft drinks and adult beverages will be available at the cash bar. NOTE TO PEO MEMBERS: Please register through your organization's Web site.